Every strings instrumentist, along with acquiring his instrument knows (or not in most cases) that he will have to tune his instrument repeatedly, developing the ability to tune a string instrument by ear could be a great advantage and may result the most economical solution. However, developing the skill of tuning by ear at that level requires time and constant practice, but while you are in the process of learning and adapting there’s a more effective way to tune your instrument and that is using a tuner, it is the best way to get a more accurate tuning at the moment to study, practice or for any kind of gigs. What is a ukulele tuner? A tuner is a small device that visually indicates the difference between an interpreted sound and the referent under the tuning criteria of A-440. Basically, it shows you the difference between the heights of each sound. There is a wide variety of tuners in the market, and you will surely wonder which is the best for you. Is there a brand with a better product? Next, we will show you a list with different tuners and also name some brands as well, we’ll review some of them so that you can have references of each product and know which one best suits your requirements. 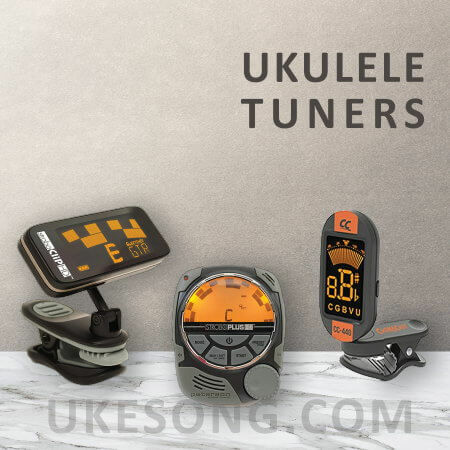 What to look for in Ukulele tuner? An easy-to-read bright display: Make it far simpler to keep you ukulele in tune. Especially if you are playing in dim or dark areas. Long Battery Life: Look for a ukulele tuner that offers long battery life. This way, you’ll have to change batteries less often this way, saving money and effort in the long run. In many models, battery power affects the look of the display screen, including brightness. 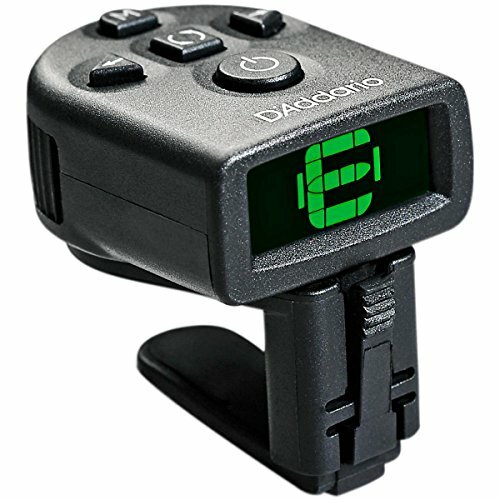 Rapid Response Time: The faster your ukulele tuner works, the better. Some tuners do not display the note (or whether the note is sharp or flat) until a few seconds after you play it. This can mean that the tuner isn’t as accurate as you’d like it to be. A slower tuner might be OK if you’re always playing alone, in an area with no other sounds. However, if there are other musicians or other noises in the room, your accuracy is going to suffer. Slip-Resistant Clip-On Style: Not all ukulele tuners are meant to attach to your instrument, but some models do clip on. If you opt for one of these, make sure it’s slip-resistant. So it remains in place and prevents your instrument’s finish from being scratched. Rotating Display Screen: An adjustable, rotating display screen makes it easier to keep your ukulele in tune. The less effort you have to expend, the faster you’ll be able to make the necessary adjustments. 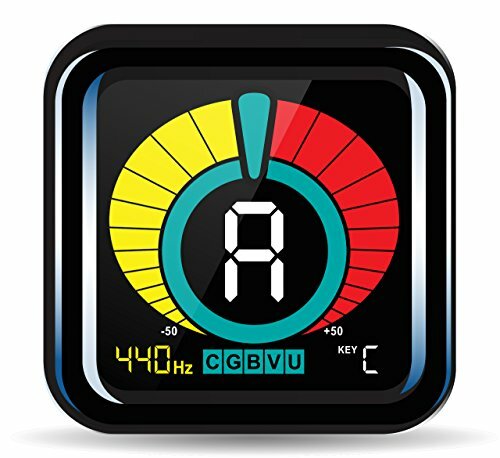 the ‘KLIQ UberTuner’, a chromatic tuner with a tuning range of 9 octaves, has a full-color display that indicates when your instrument is tuned. The frequency A-440 is adjustable between 430 and 450 Hz. It also has transposition settings for woodwind and brass instruments. FAST & ACCURATE. 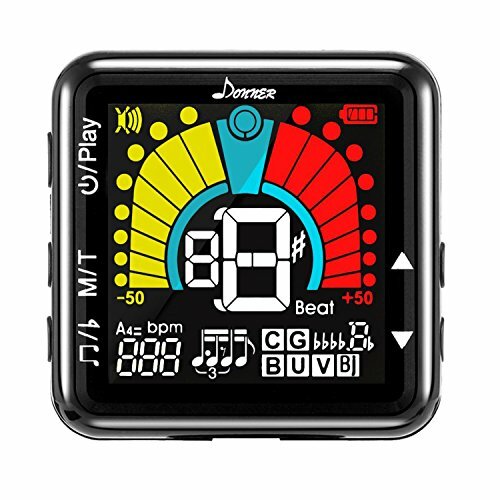 The UberTuner’s advanced Micro Processor and highly sensitive Piezo Sensor will ensure your instrument is accurately tuned in a flash. EASY TO USE Since the tuner detects the pitches directly from your instruments’ vibrations, ambient room noise will never get in the way. 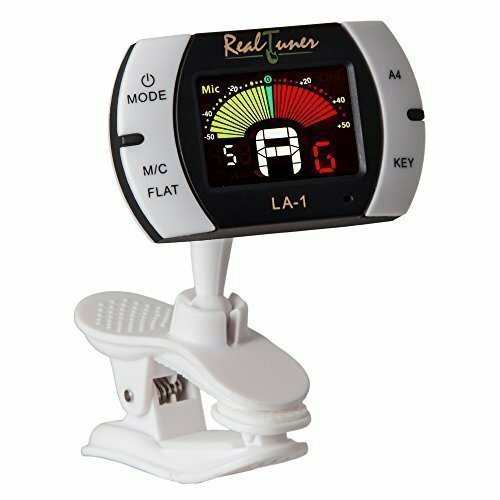 It is RELIABLE With a strong and durable design, this tuner was built to last. the ‘Snark SN6X’, designed specifically for ukulele, like the previous one, it has a full color display, has a rotating 360 ° axis attached to the hook that can be placed on the instrument’s headstock and also has a metronome. 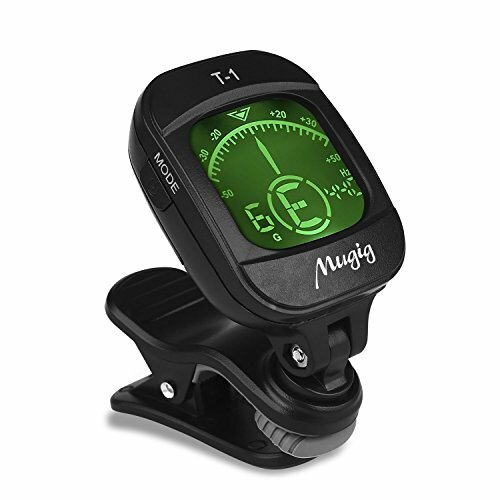 The ‘Mugig Tuner’ works equally for guitar, ukulele, bass, and violin. It has chromatic tuning, and calibration between 430 Hz – 450 Hz, fast response to vibratory frequencies that suppress background noise, ideal for noisy environments, has a hook with rotary axis to be able to use it from any angle. Supports multiple tunings: Chromatic, Guitar, Bass, Ukulele, Violin. It has a Super clear LCD display (38% greater view), barely shade incurred, rotates 360 degree for easy viewing from any angle. 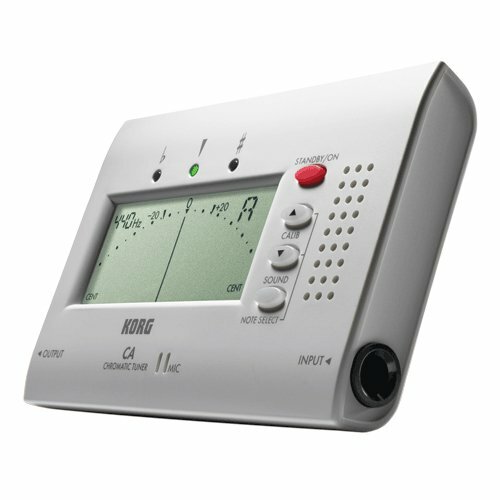 The ‘Korg CA40’ tuner, it is apparently the one that has a higher calibration range from 410 Hz to 480 Hz, it also has a wide range of octaves for different tuning types, with chromatic tuning in a full color display, and has two connectors one input and another one for output. It also happens to feature a built-in microphone, the design is very comfortable to carry and place it anywhere. The Clip On Tuner works for several strings instruments, it has a full color display with chromatic tunning also. The moist appealing thing about this specific tuner is that the device is rechargeable by USB. You won’t have to spend a lot of money on batteries or worry about your tuner dying in crucial moments. It has a very small size which makes it easier to carry and store. Metronome, Digital Tuner and Tone Generator, 3 function in 1 device for acoustic and electric guitars, bass, ukulele, banjo, violin, mandolin and wind instrument. Equipped with a 120mAH rechargeable lithium battery. Ultra-low-power and auto power-off function saves energy. Designed accurately for great performance, high precise detection and sensitive vibration clip, tuning with ±1 cent accuracy. 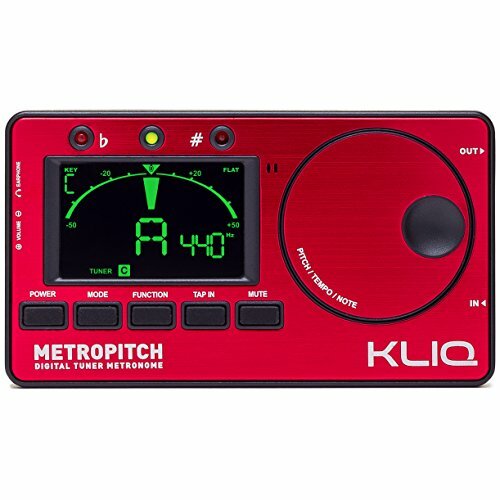 The ‘KLIQ MetroPitch’ it’s a 3 in 1 device with not only a tuner and a metronome, it also features a tone generator all housed in a pocket-sized device.. It has a input and output jack and a high sensitive built-in microphone. The metal finish it’s very attractive and maked it look with a better durability. The included carrying pouch makes for easy transport to your next gig or practice. VERSATILE TUNER: The fast and accurate tuner boasts a wide range of A0-C8, various tuning modes, transposition settings, and pitch calibration. So whichever instrument you play, it’s got you covered! EASY TO USE: The intuitive JOG Dial let’s you literally dial in your desired tempo quickly and easily. It also allows for making swift pitch selection in the Tone Generator, among many other functions. D’Addario’s NS Micro Clip-On Tuner is the cheapest one with a very discrete design that can hide behind the instrument’s headstock. It doesn’t have any jacks since it works only with sound and vibrations. Although is very basic and cheap, it’s very functional and it does what it needs to do. As most ukuleles don’t come equipped with electronics to plug in to a tuner. Therefore, it is absolutely necessary the tuner you buy has a built-in microphone. If you weren’t able to guess from the above list, Korg makes a really great portable tuners. As you go up in price-range, Boss and Peterson make great tuners. But these tuners often don’t have a built-in microphone and have only an input jack to detect the pitch of your instrument. Finally, you can always use our online ukulele tuner to tune your ukulele up. So, what’s your method for tuning your ukulele? 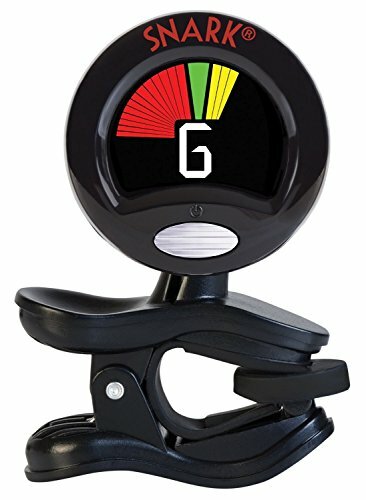 Got any tips or suggestions for buying a tuner?